​​​​​​im a little nervous about this bend to my oil cooler. It looks less bad in the picture, I'm referring to the 180 around the swaybar. It's hard to measure but I'd say the bend is 3 to 3.5 inches across and there is no kinking. i'd be more worried about it sawing though the tension rod bracket. I'd be more worried about the crappy house-brand chinesium fittings. I don't use them on things I build but I've actually never seen a summit fitting fail after being on the car and sealing properly the first time. I have seen poor finish machining on a few of the tapers that people have shown me though. I've used Summit fittings. They work okay but are a little harder to assemble. 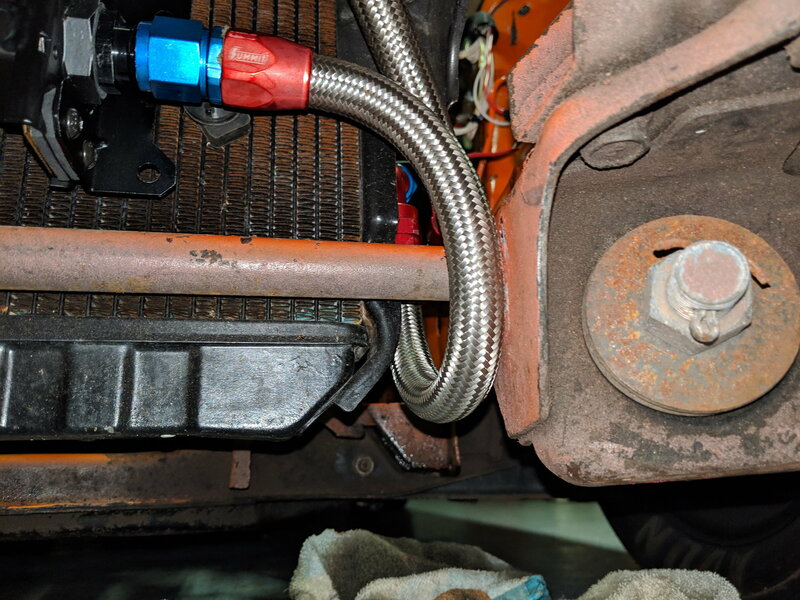 If you used a 90 at the cooler and pointed it forward the radius of the loop under the sway bar might be wider. They way it is plumbed now it is loading the fitting on the cooler more than I would like. And yeah, don't let braided hoses contact anything else because they are like hack saws. if contact is unavoidable use a piece of split heater hose as a shield. Or an Adel clamp or other device to keep it stationary. I've had good luck with the summit fittings. That bend is from tstat to cooler so no movement but it still bothered me. Like mustanghammer noted, the stress is expensive oil cooler. The plan was to use some alum tube from cooler to tstat but unfortunately I my tube bender doesn't do -10.
what is our turning radius? WTB-RX7 Tulsa, 200 mile radius.